During the last two months, I have heard many concerns about the need for improved customer service at Grambling State University. Customer service excellence is never optional at our beloved Grambling State University. Instead, it is a 24/7 expectation and priority. In order to grow Grambling as we plan, we all need to take good customer service to heart. Those of us who work for Grambling should always strive to be professional and courteous. No matter what job you are responsible for doing, you should master and practice the art of good customer service. As Grambling’s president, my goal is to replace complaints with compliments. In the very near future, I will hire a Director of Customer Service and Professional Development to make sure we give special attention to this important part of our overall operation. The credentials required for this job will be broad and comprehensive, and the person will become a key part of my administrative team. I am convinced that when we consistently deliver exceptional customer service, we will see enormous returns on investment. We want all of our students to feel good about being a part of the Grambling family. We would like their experience during their college career to be memorable, one that they can brag about to their friends and tell special stories to their children and grandchildren in years to come. Students learn more and perform better when they are treated with respect and dignity. Students also need to be responsible and accountable as well, and I know I can count on our students to do their part as a member of the GramFam and do the right thing. The faculty also teaches better when they receive appropriate respect from the administration, their students and others that they encounter. They actually come to work with a huge smile on their faces and they are eager to transform our students. After all, they went into teaching because of a love for changing lives and transforming students into responsible adults who are critical thinkers and contributing members of society. I applaud our faculty for doing a yeoman’s job everyday. Let’s not forget our senior administrative team at Grambling. They too come to work with the ultimate goal of advancing the university’s mission and growing the institution into a preeminent university of choice. Administrators are an intricate part of the rhythm of the university. Administrators have pride too and we want to be part of a winning team where a positive culture, atmosphere and professional environment are standard operating procedure. Good customer service helps us get to this point. I would be remised if I did not acknowledge the valuable contributions of our wonderful alumni. The university could not be as strong and vibrant as it is without the multitude of assistance that our successful alumni constantly render to Grambling. Many of our alumni donate critical dollars, counsel and advice to help students, who without such help may have to leave school and return home without accomplishing their lifelong goals and dreams of a college education. We continue to find ways and present opportunities for the alumni to continue to support the university. A key will be for us to always maintain open lines of communication. If we talk and listen to one another, we can resolve any and all issues. Let me reiterate that customer service is a critical component of the university’s operation. We must all take on the responsibility of delivering excellent and timely service for all of our customers and stakeholders. I am asking all divisions, colleges, departments and centers of excellence on campus to render unparelleled customer service. Keep in mind that service excellence is the lifeblood of our business. We want to make sure service excellence is “Job One” for everyone. We all have a responsibility to promote customer service excellence every day, all day long. Remember that we are: “ONE GRAMBLING: Honoring History, Keeping Promises and Fulfilling Dreams.” Go Tigers, and honor Grambling Pride! This entry was posted in Uncategorized on September 16, 2015 by admin. A 2015 graduate of Grambling State University has been accepted into medical school at the Medical College of Wisconsin and has begun her journey to become a neurologist. Alicia Ivory earned a Bachelor of Science in Biology from Grambling State University in May, which she credits as laying the foundation for her future in neuroscience. “Prior to coming to Grambling, I had little knowledge of Ph.D. careers in research and academia,” Ivory said. “I came to get my Bachelor of Science degree and continue on to medical or pharmacy school to do clinical research. While at Grambling, I was encouraged initially by Dr. Paul Kim, an assistant professor of biology, and Dr. Ben Martin, an associate professor of biology, to look into a Ph.D. program. “Later, I became a MARC program participant (a scholarship program for biology, chemistry, math, physics or computer science majors committed to pursuing an M.D./Ph.D. in biomedical sciences). The MARC program rocked my world! I was exposed to so much research at conferences and in my subsequent research experiences. It was then that I decided to pursue a career as a physician scientist with an M.D./Ph.D. program,” Ivory said. The single mother of a young son and daughter is now pursuing a M.D./Ph.D. program at the Medical College of Wisconsin, where she is researching how aphasia, a group of speech disorders caused by brain damage, correlates to specific brain lesions after ischemic stroke, which occurs when an artery to the brain has been blocked. Once she finishes graduate school, Ivory plans to work in a faculty research position and in a clinic as a neurologist or neurosurgeon, but she is grateful to Grambling State University for helping her on her path. “I love Grambling for all that it caused me to cultivate academically, socially and spiritually. It groomed me well to be a self-directed learner and a critical thinker. I have had to dig into my Grambling tool box quite often during my short time as a graduate and medical student,” she said. The senior mass communication major was introduced to an opportunity to write for the South Carolina-based publication, Sheen Magazine, by her supervisor, Tracy Wright, director of University Communications at Grambling State University. Sheen Magazine is a Southern national lifestyle and beauty publication. The magazine is the preeminent voice for the American beauty on new trends, techniques and products. The bi-monthly publication always remains current on what is happening and what you need to know in the field of beauty, fashion, hair and entertainment. As a virtual intern at Sheen Magazine, Gipson was able to learn more about covering events from out of town, conducting professional phone interviews with celebrities, editing and the importance of meeting deadlines. Gipson’s story was printed in the September/October edition of Sheen Magazine. The story was a feature on well-known singer, songwriter and actor Tank. Gipson got to interview the multi-talented star about his music, physique and role in the new TV One Show entitled “Born Again Virgin”. What Gipson loves the most about interviewing and writing is that it does not feel like work to her, because she has such a passion for it. Although Gipson did not get to attend the events firsthand, she loved that she got the opportunity to write recaps of nationally viewed award shows such as the Black Entertainment Television (BET) Awards 2015 Red Carpet and the Council of Fashion Designers of America Awards (CFDA Awards). These stories were published online. The young, award-winning journalist has also been published in Houston-based magazine, Houston Style Magazine, and an Atlanta-based online magazine, JubileeMag. Sheen Magazine will be sponsoring this year’s Bayou Classic. As a student of one of the HBCUs involved in the event, Gipson is excited to help cover an event that has such historical value to her university. While the Tigers took on the University of California Berkeley on the football field on Sept. 5, the Office of Admissions & Recruitment, Student Ambassadors and the Student Government Association (SGA) of Grambling State University traveled to California earlier in the week with a different goal in mind: to recruit as many students from the Bay area to attend Grambling State University for the 2016-2017 school year. Meadows was joined by fellow SGA members Taylor Stewart, director of media relations and student ambassador, Chief Justice and Student Ambassador Cecil Holt, Sophomore Class President and Student Ambassador Adarian Williams and Executive Assistant Jalexi Heard. Grambling officials included LaTari Fleming, transfer recruiter, Chemia Herron, assistant director of Admissions, David Ponton, vice president for Student Affairs, Sharon Perkins, director of Favrot Student Union, and Barbara Payne, campus-wide activity coordinator. Fleming worked with Sandy Carpenter and the Oakland Chapter of the Grambling University National Alumni Association and NAACP to coordinate all of the school visits. The recruiting team visited four high schools in California: Oakland Technical High School, Kennedy High School in Richmond, Oakland High School and Berkeley High School. The recruiting trip resulted in more than 150 students applying to Grambling during the recruiting on Sept. 3-4. When I accepted the presidency at Grambling State University, I immediately knew it was a special and unique place; not only for the wonderful teaching and learning, but as a place where the word family is not just a slogan, but also a living example of how people should care about one another. The belief that family is important continues to be born out each day at Grambling by numerous acts of kindness. On last Thursday, August 27, Tropical Storm Erika ravaged the beautiful Caribbean island nation of Dominica, causing flooding and mudslides as over 10 inches of rain fell on the island in just six hours. The storm has been devastating to all Dominicans. Damaged bridges and roads have left many communities in isolation and without basic needs. A large area of the island has been without electricity, water and telecommunication services. Sadly, at least 20 lives have been lost, many are still missing, and thousands have been evacuated from their homes. Prime Minister Roosevelt Skerrit has declared the communities of Bath Estate (Paradise Valley), Dubique, Petite Savanne, Campbell, Coulibistrie, Pichelin, Petite Sourfriere, Good Hope and San Sauveur as disaster areas. The country has undergone a recent infrastructure improvement. Unfortunately, all of the efforts in that area must be redone. Several commentaries have said that this devastation has “set the country back 20 years.” Many countries are assisting in the relief efforts, including Venezuela, St. Lucia, Cuba, St. Kitts, Nevis and the United States. I want to call everyone’s attention to the fact that 40 students from Dominica are enrolled here at Grambling State University, and there are others who are still in the country and trying their best to return to school. As the televised news fades about this enormous tragedy, we, the Grambling State University family, will mobilize our efforts to help our students. To that end, I have asked Mr. Otto Meyers, Dr. David Ponton and Ms. Greta Carter to work with the university community to pull together a campaign to raise money through a relief fund. A safe and secure mechanism will be established, so that our 40 students and members of their families can be assisted during this time of grief and despair. The specific details of the relief effort will be forthcoming. I want to express my sincere thanks and appreciation to all of our students, staff and faculty who came out yesterday to offer support and encouragement to our Dominica students during a unity gathering and prayer service. This outpouring of love and caring was an awesome display of “family.” Once again, that’s why I love Grambling State University. This is yet another example of the Grambling family coming together in a time of need. GSU Students and Administrators gather to pray for victims of natural disasters in the Dominican Republic. This entry was posted in Uncategorized on September 1, 2015 by admin. Members of the Student Government Association perform the GSU Chant with meteorologist Brian Fowler on the KTBS 3 morning news program on Aug. 27. Many Gramblinites had an early morning on Aug. 27 as they gathered in the Yard to represent Grambling State University on KTBS 3 morning news from 4:30-7 a.m. KTBS has been traveling around the Ark-La-Tex to promote local colleges and universities. Fowler was joined by the GSU cheerleaders, the Orchesis Dance Company, the Student Government Association (SGA), Miss Grambling State University Joiya Smith and her Royal Court, the World Famed Tiger Marching Band, Transfer Recruiter and Enrollment Specialist Latari Flemming, Interim Athletic Director Obadiah Simmons and Head Football Coach Broderick Fobbs. Coach Fobbs had a chance to preview Grambling’s first football game of the season against the University of California Berkeley on Sept. 5. SGA President Jonathan Wallace had a chance to welcome students back to Grambling for the new school year and highlight the Eddie Robinson High School Football Classic on Aug. 29 and the upcoming SGA elections Sept. 9-12. “It caught us off guard, but when you are called on to represent Grambling State University, it’s always exciting. You don’t get opportunities like this all the time,” Wallace said. Miss Grambling State University 2014-2015 Ginia Smith (second from left) is shown with three other winners from EBONY magazine’s Campus Queens contest during a photo shoot at Howard University. Miss Grambling State University 2014-2015 Ginia Smith beat out dozens of beauty queens from Historically Black Colleges and Universities around the country to reign as one of EBONY magazine’s Top 10 Campus Queens who will grace the pages of the September issue of EBONY. Since Smith was one of the top 10 beauty queens who received the most online votes, she traveled to Howard University in Washington, D.C. in June for a 12-hour photo shoot with hair and makeup stylists and lots of wardrobe changes. During her tenure as Miss Grambling State, she founded a community service organization called Heart of a Tiger, created Grambling’s Next Top Model scholarship competition and began an empowerment program for women on campus called G-Talk. Smith graduated from Grambling with a degree in biology in May. She is now attending dental school at Howard University, and she hopes that Gramblng’s queens will continue to win this contest in the future. “Before I went to the photo shoot, I had only been in D.C. once when I was 10. I never thought that I would be living there, but I am still GramFam. I am always going to be black and gold. I feel like this is a tradition that Grambling should continue. This year marks the second year that Grambling has been in EBONY magazine, and it would be awesome if we could get it every year,” Smith said. Annie McConnell Brown, professor emerita of business, was taken by surprise as friends, family, former students and co-workers threw her a surprise party on Aug. 24 in celebration of her 80th birthday and her legacy of giving back. To honor Brown for more than 35 years of dedicated service and continued support to Grambling State University, Erick Valentine, interim dean of the College of Business, presented her with a plaque recognizing that the Center for Student Professional Development (CSPD) conference room in the Jacob T. Stewart building will be named in honor of Brown. Brown began her journey at what was then Grambling College, as a 17-year-old freshman who attended college with her twin sister. She graduated from Grambling College in 1957 with a degree in business education and began working at the college in 1966. 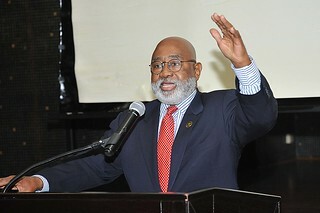 Brown’s career at Grambling State University spanned for more than 35 years as an assistant professor, associate professor, professor of business, acting head of the Department of Computer Information Systems and director of Business Undergraduate Studies. Upon her retirement in 2001, she was bestowed the university’s prestigious title of professor emerita of business. Brown has continued to act as a model of service for future Gramblinites during her retirement as she has volunteered in many capacities, including serving as advisor for the GSU Administrative Professional Organization and honorary chair of the Sixth Annual College of Business Scholarship Breakfast in 2014, which raised more than $14,000. She has also donated funds to establish the Annie McConnell Brown Endowed Scholarship in the College of Business, a gift that has already helped many students achieve their goal of obtaining a college education, and is in the process of creating a second non-endowed scholarship at Grambling. President Willie Larkin has issued a challenge to the employees of Grambling State University for the ALL-IN University Giving Campaign. Can you raise $50,000 in 45 days for the love of Grambling State University? 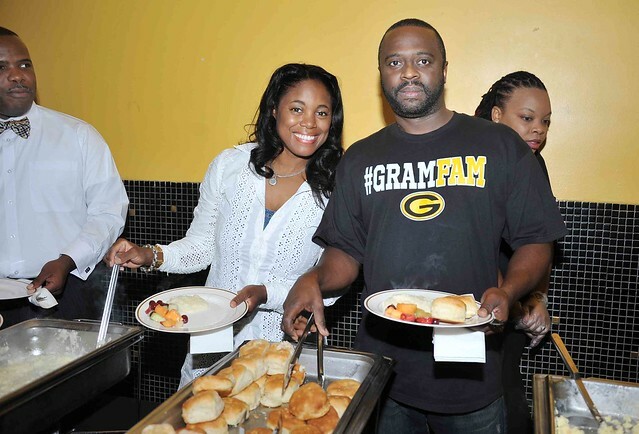 Grambling’s employees answered in a big way by raising more than $25,000 since the campaign’s kickoff breakfast on Aug. 28. President Larkin answered his own challenge with a $1,000 donation. “Giving money is a state of mind,” Larkin said. “Philanthropy is not something that a lot of people automatically do. As a culture, we’ve always given, but to give hard earned money, a lot of time it is hard to give the money and let it go and trust that it will be used properly. What I am asking you to do is to trust, and that will be evidenced as to whether your trust is well placed. We are going to do some really great things, and at the end of the day, we’ll all be excited about it.” The ALL-IN University Giving Campaign is an annual fundraising effort that directly benefits the students of GSU as well as university employees. When you give a gift to the University Giving Campaign, your gift provides critically needed scholarships, departmental support for academic excellence and other special project funding that benefits our students and employees. The first phase of the ALL-IN University Giving Campaign is the employee-giving campaign that serves as an opportunity for employees of Grambling State University to support the university financially. The importance of taking the time to donate now is in the benefits it will yield for the future Tigers who will attend Grambling State University long after we are gone. “Wouldn’t it be great if we could stretch our minds to the point where we could fathom a 100-year strategic plan and know that we are not going to be here to see it,” he said. “The power in that is that we are thinking about future generations. I have four grandsons and they are young, and they will be the benefactors of everything that I do and every contribution that I make to society. We have got to think bigger and farther than just ourselves.” The campaign will end on Oct. 22, just in time for the results to be announced during halftime of the Homecoming football game against Mississippi Valley State on Oct. 24. Donations can be made by cash, check, money order, credit card and pledge card/payroll deduction. For more information on how to give to the ALL-IN University Giving Campaign, please contact Rose Wright at 318-274-2217.